Sixteen year old Starr Carter moves between two worlds, the poor neighborhood where she lives and the fancy suburban prep school she attends. The uneasy balance between these worlds is shattered when Starr witnesses the fatal shooting of her childhood best friend, Khalil, at the hands of a police officer. Khalil was unarmed. Soon afterward, Khalil’s death is a national headline. Some are calling him a thug, maybe even a drug dealer and a gangbanger. Starr’s best friend at school suggests he may have had it coming. When it becomes clear the police have little interest in investigating the incident, protesters take to the streets and Starr's neighborhood becomes a war zone. What everyone wants to know is, what really went down that night? And the only person alive who can answer that is Starr. Keep your hands visible. No sudden moves. Only speak when spoken to. Sixteen year old Starr Carter lives in Garden Heights, a neighbourhood with a strong black community, thriving among the Kings and Queens of the streets. Starr now kneels beside Khail's lifeless body, blood staining her hands from the police offer that fired three bullets into her childhood friend, racially profiled for being a black teen confronted by a white police officer, his weapon now aimed at the young teen as she grieves for her friend. Garden Heights erupts, the injustice of another young black man slain on the street at the hands of a white police officer and the frustration of community voices being ignored. While the media portrays the police officer as a family man protecting the community, Khalil is depicted as a criminal. Khalil was unarmed. Khalil was innocent. His death cannot be justified. While the community calls for justice, the police begin enforced Marshall Law, placing a curfew on the black community as gunshots sound across the night and protesters ensure their voices heard. The cries of justice, of equality and to ensure black citizens are being protected by a country often separated by race. Starr is a beautiful young woman, passionate, intelligent with a wonderful sense of community. Born into the public housing system and at ten years of age, Starr witnessed a child's life stolen while playing in the street, her parents insisting Starr attend a predominately Caucasian school along with step brother Seven in order to ensure their daughters safety. Starr's parents are wonderful. her father a local business owner after spending time in prison, a former King of Garden Heights in the gang community. Starr's mother is a local nurse, wonderfully maternal and both parents pillars of the community and a rarity in young adult. 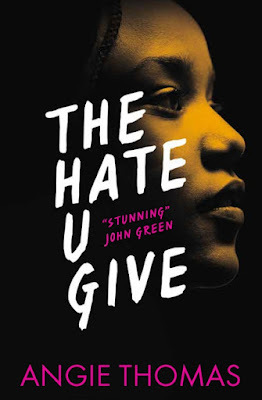 The Hate U Give is a compelling narrative that explores firearm legislation, racism, police brutality, racial profiling, homicide, organised protesting and rioting. I found the narrative confronting, not as a Caucasian reader but as an Australian. A mother who grieves her only child who's life was stolen by gun violence isn't a Hollywood narrative, The Hate U Give will provide readers with perspective and the harm of perpetuating stereotypes. Now I am that person, and I'm too afraid to speak. An interesting aspect is the concept that African Americans are pressured by white society to conform both directly and indirectly. As Starr attends a school where the majority of the student body is Caucasian and as only one of two students within her peers who is African American, feels the need to conceal her cultural identity, perhaps a result of the white lens viewing African Americans as being inferior. In that regard, I felt as though the narrative was also inclusive of white readers, to connect to a fictional character in order to place the onus on white society for being exclusive. Hailey was a character who used casual racism against her peers and in particular, friends Starr and Maya, who is of Chinese heritage. Her comments are deeply offensive and it touches on one particular scene in which Starr is speculating as to why her friend Hailey unfollowed her on social media after posting graphic images of a young black man who was slain. It is later revealed by mutual friend Maya as to why, but it highlights the nature of uncomfortable white communities when confronted by African American injustice. In particular, white America. The narrative also acknowledges African American societal references, such as musical influences, activists Huey Newton and Bobby Seale and the Black Panthers, a revolutionary black nationalist and socialist organisation who fought for black rights against society and the United States government. The Hate U Give is a powerful and compelling narrative about the racism that divides communities and racial profiling that results in black lives being lost to police officers who have vowed to protect the community. Around the world, awareness spread. Not of the black teens and adults being murdered by white police officers but the white lens coverage focused on the riots that proceeded this horrific injustice. Television media being relayed from the streets were quick to condemn the angry and justified protests, but it was through various social media avenues is where the genuine and unbiased, unprejudiced reports were being shared. By those protesting. The Hate U Give allows readers an opportunity to delve into the lives behind the headlines and why the #blacklivesmatter movement demands attention. To my brilliant ladies Tika, Brittni, Ari and Blessie who guide me, never tire of my white girl questions and place me in the box of shame. Thanks Sunny, I really appreciate your kind words. I tend to feel a disconnect to so much of what happens in the United States, so having a book like The Hate U Give not only gives us an opportunity to understand through the eyes of a fictional character that is representative of so many young teens. It's also encouraged discussions which has been influential in itself. I think I'll need chocolate, tissues and camomile tea to get me through this read - I am envisioning myself getting extremely emotional while reading it. Bless the publishers for getting these stories out there for the world to read! It was a story that desperately needed to be told and my goodness, it was confronting and oceans away from our relatively peaceful country. I couldn't agree more! The media coverage in Australia is very limited and we have to scroll through social media to understand what is going on with the movement. It's an important and influential read. Great review. The book is doing really well and I'm so happy for the author. This is a really important topic especially in today's times. I hope to read it soon. Number one on the New York Times list I believe Lauren, which is an indication of how we need diverse books and how well they're also selling. Such an important read that surprised me. It was so heartwarming and family orientated as well. Me too! It's very US centric but it really touches upon all aspects of racism and profiling, which is something that most people have been guilty of at one point or another. Just a different cover for the UK and Australian market Ailyn. Same incredible content and a must read for every young adult, new adult and adult reader this year. I can't wait to see what you think of it Lily! Will be keeping an eye out for your review. This book has been the talk of the town! Glad the narrator was compelling and the story captivating! Lovely review! Thanks Cyn and it certainly has, for very good reason. It was completely captivating. Your reviews are always so well written and eloquent Kelly! And I totally agree, this was such a phenomenal read I need everyone to read this book! Thanks Anisha and I couldn't agree more. I would love to see this book in secondary colleges, especially in the US. A very important, timely read. America's notoriety on social injustices makes me angry and sad. It really is Joy and not a moment too soon. It really is such an important read not only for African Americans to see themselves within young adult fiction, but for white readers to rally around diverse and own voices authors with important stories to tell. I think that - now more than ever - stories like these are essential. I am so glad to hear that you enjoyed it so much - it sounds so powerful and emotional. Thanks for sharing and, as always, fabulous review! Thanks Zoe and it truly is. I knew it would be emotional but the connection I felt to the characters really surprised me. Reading with a group of wonderful friends who allowed me to ask questions about the content and their experiences was so important and I found that I could really connect to Starr. Everyone seems to be really loving this one. Glad to see it's also been successful. It was wonderful Karen, truly a must read. I loved this book so much <3 The hype is really really worth it in this case. So excited that it made the NYT list! Wasn't it wonderful, it knocked Carve The Mark off the top spot too I believe. This book sounds so powerful and so timely. I know I am nowhere near as knowledgable as I should be with respect to race issues (and feminism) for that matter, but it's books like this that help us (me) learn. Wonderful review as always, Kelly. You always make me *think* with your reviews. Thanks Verushka, that's a wonderful compliment. It's such an important and eye opening read. I think we're pretty protected here in Australia and don't see much in the traditional media. Being confronted by the injustice through fictional characters really had am impact on me personally. I'd love to see what you think of it. Wonderful review, Kelly! I agree with everything you've written, and you expressed your thoughts very eloquently. In increasingly conflicted sociopolitical times like these, I think it's so important to have books like these that offer perspectives and narratives that the majority has not experienced. I really felt connected to all the characters, and I felt their pain, but I was also fully aware that this book was not about me, despite being a person of color myself. It was about black youth in the US, the struggles they face every day - there's a certain power in that. Again, wonderful review! Thanks Aimal. I truly was amazing. Being white, I understood that the narration wouldn't hold the same emotion that it would for African Americans, so I was lucky to have roped in a group of friends to read with. They were wonderful at helping guide the storyline for me and it really made it more than just Starr's narrative, hearing their stories and how they were able to relate really took it to an emotional level. Not only being white but also being Australia, there is a different political climate here and it was important as a reader and friend to see the difference through the eyes of those who it effected most. I don't know if I make sense, but I am scared to read this book. I have no doubt that it's going to be amazing, but the intensity it promises is making me scared to start it. Hopefully, I'll end up reading it one day.Beautiful review, Kelly! I've wanted to read it since it was announced too, but was worried that I wouldn't be able to fully grasp the narration too Mishma by not being the intended target. I read it with a wonderful group of friends who were able to guide me and answer questions, so maybe a buddy read with friends might be in order? This is actually incredible. Thank you so much for reviewing this book and letting me know about it!